Wow! Welcome to the Keyhole! The route’s namesake notch is at 13,140 feet, and is perhaps the most dramatic position on your journey. Your arrival at the Keyhole marks a major milestone in your ascent. After the last steepening scramble into the Keyhole, you will be rewarded with new views that will surely rock your senses. You can look west across the appropriately named Glacier Gorge at that cirque’s major peaks: McHenrys, Chiefshead, and Pagoda. You are nearly as high as those peaks, but Longs’ summit is still over a thousand feet above you. Click a cover for information on that edition. This exciting DVD takes you on a visual tour of Longs Peak, the highest peak in Colorado’s Rocky Mountain National Park. Longs is one of the most dramatic peaks in the Rocky Mountains, and this product will show you four dramatic routes on Longs: the Keyhole, the Loft, the North Face, and Kieners on the East Face. Additionally, the DVD will take you on two dramatic flights around the mountain, one in summer, and one in winter. 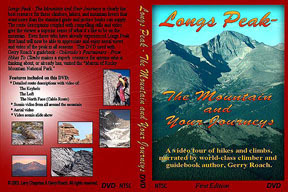 The Second Edition of this DVD has an expanded scenic slideshow of the mountain from all sides. Also, new in the Second Edition is the poem “Mother Longs” by Larry Chapman. Photographed by Larry Chapman and narrated by Gerry Roach, this visual and audio feast makes a perfect home companion to Gerry’s Fourteeners guide, or you can buy the DVD by itself. Click to view a video sample on Windows Media Player. Click to view a video sample on Quicktime. View a live webcam of Longs Peak! While supplies last! We have less than 8 left. plus $6.10 for Priority Mail if your total order is less than $35.00. This exciting DVD takes you on a visual tour of Longs Peak, the highest peak in Colorado’s Rocky Mountain National Park. Longs is one of the most dramatic peaks in the Rocky Mountains, and this product will show you the three easiest routes on Longs: the Keyhole, the Loft, and the North Face. If your intent is to climb the Keyhole Route, then the First Edition may be all that you need. Additionally, the DVD will take you on two dramatic flights around the mountain, one in summer, and one in winter. The DVD also has a scenic slideshow of the mountain from all sides. Photographed by Larry Chapman and narrated by Gerry Roach, this visual and audio feast makes a perfect home companion to Gerry’s Fourteeners guide, or you can buy the DVD by itself.